Japan Update #17 - Whatever goes up, continues going up! This past weekend was a four-day holiday weekend in most of Japan. It is harvest Matsuri (festival) time. We took advantage of the only day forecast to be free of rain and went on a longish ride on Thursday. We drove about 10 kilometers for a remote start on the other side of Fukuroi, the closest city to where we live. As we unloaded the Santana from the roof rack it started to rain. So much for the weather forecast! We sat in the car for about ten minutes then it cleared. Of course we wore our booties to appease the rain gods. We set off heading north into the mountains on a route that we have done two other times. 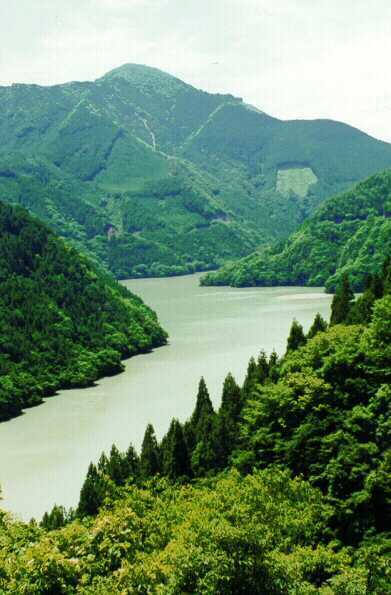 However, each time we have taken a different path over the mountains. The first time we took the direct approach and were rewarded with multiple 10-12% grades going up, and so many curves on the way down that I was braking almost continuously. The second time, we went around the top of the mountain and were rewarded with our first long run out downhill in Japan. This time we planned something between those options. At the top of the easier route, we go through a tunnel and then head down. However, we had noticed a road going west from the tunnel exit and after checking our maps decided it would be a nice alternative. On the map it appeared to have a little climb to get over the tunnel and then would be going down along a small river to the valley below. Well, we went through the tunnel and started this extra little climb. This, of course after having just done 3-4 kilometers of 5% to get to the tunnel, plus whatever 1% grade we had been on earlier. The climb up was steeper than expected but doable and we survived. We started along the ridge road, with a slight downhill and thought, "this will be nice". We came to an intersection and on our map it showed our road as going straight at all the intersections. Then we started climbing, and climbing. I said that I didn't think I had misread the topographic map that badly, but I guess I did. In my defense I should point out that on each full double page map there are only one set of numbers for the topo lines and sometimes it is virtually impossible to follow them around the map to be fully cognizant of ups and downs. Even if you do track the lines, you may not know if you are encountering a small hill or a large crater! But I digress! The climb got steeper. We weren't climbing long before I started thinking about stall velocities. We finally crested this short, steep section and had level road in front of us. I asked Lindy what direction we were heading. When she said south, I said Uh Oh. We then came to what is like a county line sign. We were entering the "Cho" we had left before the tunnel. Not a good sign. There was a house/store nearby with voices coming from it so we backtracked and the premier linguist amongst us (not me) went in for a consultation. Inside was a kindly old woman who had been watching TV. Lindy showed her the map and said, "Ima, doko desu ka? "; now, where are we?. Well it took a while for the woman to understand the map, but eventually she did. With pointing, and a lot of gesticulating she told us to go back to the intersection where we had gone straight and to turn left (the other option we could have taken). She also strongly advised us against some other roads but that part we were never sure about. She kept telling us how difficult it was to ride a bike up where we were. That piece of information we had already obtained first hand (first leg?). We thanked the woman profusely, and headed back from whence we came. That really steep downhill required a lot of braking for its' short distance. Having anti-skid grooves cut horizontally across the surface did not bother us on the way up, but made the downhill run verrry bouncy. By the time we got back to the "intersection" we had dropped almost 50 meters. Not bad for a 0.6 kilometer wrong "not turn". We got on what we thought was the correct road and started the nice gradual descent. Then there was another intersection. What appeared to be the main road went left and this other road went down to the right. The map showed another road that went off to the right and then dead-ended about 50 meters above (literally) the town below us. We chose the left fork as the safer alternative. If it was wrong at least we would be able to recover without having to climb back up a couple of hundred meters. This road became very much a back road after that intersection. It followed a stream going gradually downhill. There was apparently very little traffic on it (we did not see any other vehicles, 2 or 4 wheeled) since I had to dodge vegetation that was growing into the road. In the shady areas the pavement was covered with moss. Needless to say, I took the shady corners very carefully. Wet moss can be nasty! This road just kept going down, seemingly forever. Our estimate of distance from the map scale was way off, probably due to the curvaceous course the road took. Eventually, we got to the bottom. 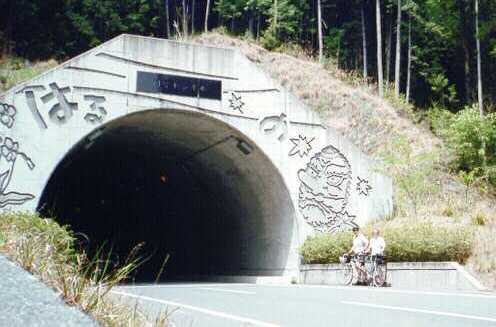 It was really a beautiful road, one worth going back and riding again. By now we were ready for a pit stop, but since we had bypassed the town we did not know if we would find toilets. Ah Ha! A temple with a parking lot. A good sign. There in the corner of the parking lot, bathrooms. We have learned that the many temples that are all over Japan frequently have toilets available. We also took the opportunity to explore this temple. Nothing special, but boy we did we get strange looks from the locals. Apparently some type of village ceremony either had just ended or was gong to begin shortly. Well, back on the tandem and off to follow the river. 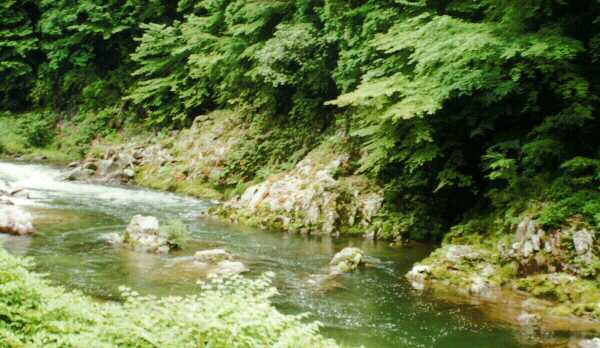 I don't know the name of this river, only that it was going to join the Tenryu Gawa, our favorite riding area. This river wound and meandered its way for about 15 kilometers, a crow could have done it in 7. It was really kind of nice in that when we would look left "across" the river, half the time the road we saw was the one that we would be on in a few minutes. At about the time I was beginning to think we had missed our turn we came to yet another bridge. This one had a familiar look to it. I thought it was the one we cross when we come from the opposite direction. There was man walking away from the bridge so we (Lindy) asked for directions, again map in hand. He looked at the map and told us to cross the bridge and that would be the correct way to go. When Lindy asked him where on the map we were, he pointed to a bridge 7 kilometers up from where we thought we were. But if that was true, his instructions would have us going in the wrong direction! We decided that instinct and directions would prevail over his map reading skills. Across the bridge we went. And it was correct. The road looked familiar. We followed this small road along the river as it went up and down tandem rollers all the way to the main road. 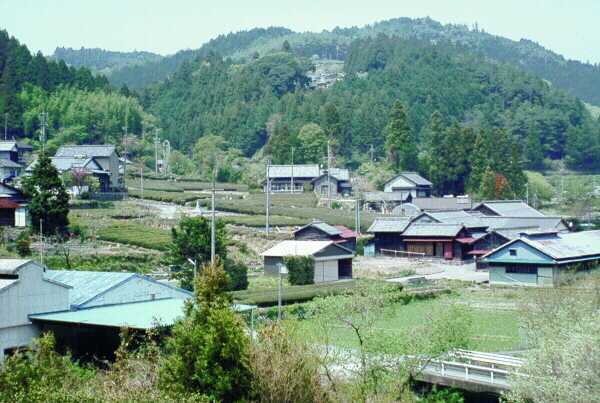 From there we headed south toward Tenru-shi (heaven's dragon city). While we were making a short stop on the side of the road, a "real cyclist" passed us. A real cyclist is anyone with drop bars (or a real mountain bike) and a bike helmet. We decided to give chase, but by the time we got going he was about a kilometer in front of us. We were rapidly gaining when Lindy said something was scratching her. We stopped quickly, fastened down the errant wire, and started the chase again. To no avail. He was ahead of us and we were losing the open and slightly downhill section that had helped the pursuit. But, at least we got in our 5 kilometers of interval training! One more pit stop at the dam, you know, all that running water, and we set out on the final leg back to the car. The last 2 kilometers had one moderate hill, which was followed by a great downhill with a long run out. It is really great to blast down that section, especially when there are no cars in front to slow us down. It's nice to finish a ride in such an exhilarating way! Great ride, great views, nice people. BTW, these henna gaijin (strange foreigners) have made reservations for a four-day bike trip this coming weekend. We'll take a train up into the Japanese Alps (Nagano Prefecture) and take four days to bike back to our car which will be left about 40 kilometers from home. 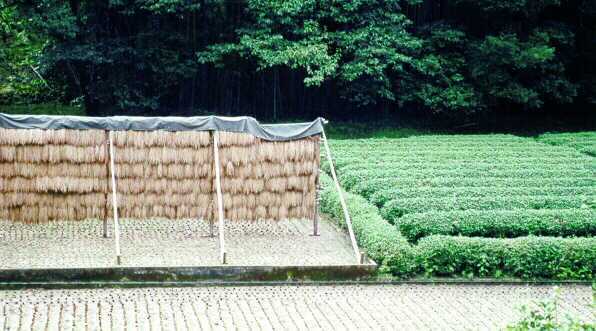 We'll stay at the local Minshukus (fish and futon) and tour a section the old historic road from Kyoto to Tokyo. The only big concern we have (besides the weather) is the 4600-foot pass we have to climb. Based on the maps, the actual tough part of the climb will be an average 5% grade for 10 miles. For a gravitationally challenged couple, that sounds tough. I am figuring about 3 hours to climb it, including stops. If we make it, I'll try to get a story out within the week. If not, it's been nice!